In the Fall of 2012, artist Evan Anderman had the opportunity to make photographs on an expedition to the Arctic. The tour visited three distinct geographic regions in the North Atlantic: Spitsbergen, Greenland, and Iceland. The Arctic Impressions exhibition series explores the sites encountered on that expedition. At the end of the cruise Anderman disembarked in Reykjavik and chartered an airplane to photograph Iceland from the air. Using his experience as a pilot, Anderman was able to see the landscape differently and precisely guide the pilot on the adventure. 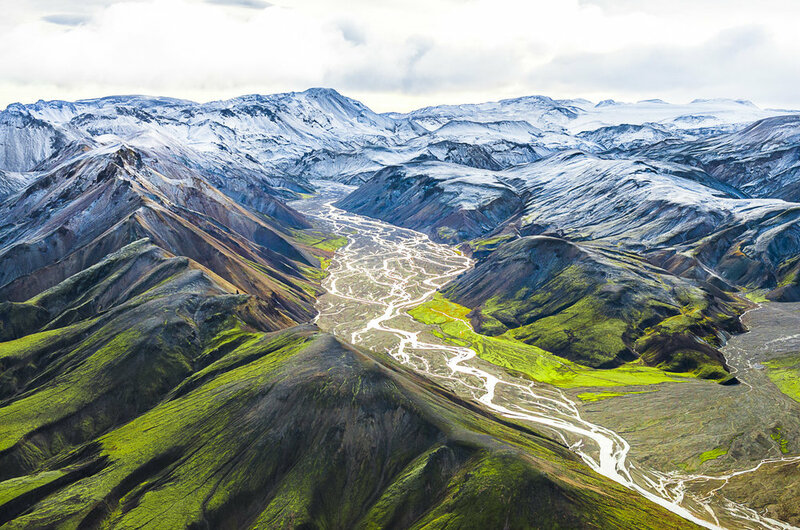 The resulting images provide a unique perspective of Iceland that most visitors haven’t seen. The angle of view compresses the landscape and the lack of horizon make the images almost seem fake, but they aren’t. The soft light and vivid spectrum of colors paint the diverse landscape in an enchanted and magical way, feeling more impressionistic than abstract. This is landscape like you have never seen before.